[Kevin] brings us Golem, his latest robot project. Golem is crafted not of clay and stone like his namesake, but of T6 Aluminum and Servos. We don’t have a banana for scale, but Golem is big. Not [Jamie Mantzel’s] Giant Robot Project big, but at 2.5 feet (76.2 cm) in diameter and 16 lbs (7.3 Kg), no one is going to call Golem a lightweight. With that kind of mass, standard R/C servos don’t stand much of a chance. [Kevin] pulled out all the stops and picked up Dynamixel MX64 servos for Golem’s legs. Those servos alone propelled the Golem’s costs well beyond the budget of the average hobbyist. Kevin wasn’t done though. He added an Intel NUC motherboard with a fourth generation i5 processor, a 120 Gigabyte solid state drive, and 8 Gigbytes of Ram. Sensing is handled by gyros, accelerometers, and an on-board compass module. We’re assuming from the lack of a GPS that Golem will mainly see indoor use. We definitely like the mini subwoofer mounted on Golem’s back. Hey, even robots gotta have their tunes. Golem is currently walking under human control via a Dualshock 3 controller paired via bluetooth. 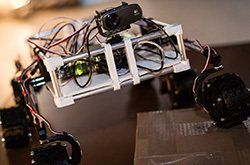 [Kevin’s] goal is to use Golem to learn Robotic Operating System (ROS). He’s already installed ubuntu 13.04 and is ready to go. [Kevin] didn’t mention a vision system, but based on the fact that some of his other robots use the Xtion pro live, we’re hopeful. We can’t wait to see Golem’s first autonomous steps. Over at the Artisan’s Asylum hackerspace in Somerville, MA, something terrifically awesome is happening. They’re building an 18-foot diameter, 2-ton ridable hexapod that can walk over a car. 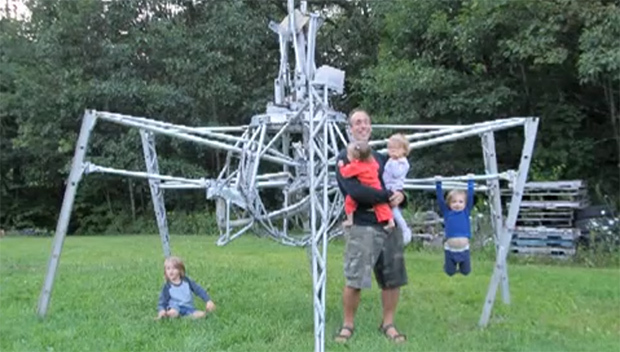 It’s called Project Hexapod and they need your help. Over the last year or so, the team behind Project Hexapod has developed an amazingly inexpensive hydraulic control system for each of the six legs and created a 1:1 model of the leg fastened to a wheeled cart to get the kinematics down pat. Now, with thousands of pounds of steel already watercut for the legs, they’re turning to the community for a little help with the welding. The Project Hexapod team estimates they have about 1100 hours of welding time in front of them. They’re looking for a few people around the Boston area that are familiar with steel fabrication and are willing to work on a two-ton robot that can walk over a Volkswagen Beetle. The guys have put up a little application form if you meet those basic requirements. You can also check out their Facebook page for any announcements and a whole lot of pictures. Moving your hand makes this hexapod dance like a stringless marionette. Okay, so there’s obviously one string which is actually a wire but you know what we mean. The device on the floor is a Leap Motion sensor which is monitoring [Queron Williams’] hand gestures. This is done using a Processing library which leverages the Leap Motion API. Right now the hand signals only affect pitch, roll, and yaw of the hexapod’s body. But [Queron] does plan to add support for monitoring both hands to add more control. We look at the demo after the break and think this is getting pretty close to the manipulations shown by [Tom Cruise] in Minority Report. Add Google Glass for a Heads Up Display and you could have auxiliary controls rendered on the periphery. While you’re looking at [Queron’s] project post click on his ‘hexapod’ tag to catch a glimpse the build process for the robot.